INDIANAPOLIS, IN - Congratulations to our 6 teammates who competed at U.S. Masters Spring Nationals in Indianapolis, May 10-13. Bill Davis, Jen Downing, Dan Epstein, Sue Jensen, Chris Pasterczyk and Fred Schlicher joined 36 swimmers from New England Masters to compete in this annual championship meet. U.S. Masters Swimming holds two national championships every year — a short-course yards meet in the spring (April/May), and a long-course meters meet in the summer (July/August). These championship meets typically draw over 2,000 competitors, with 20 lanes racing at the same time. While there are qualifying times to participate, these meets are open to everyone no matter what your speed. Masters swimmers may enter up to 3 events without qualifying, and can participate in club relays as well. These meets provide a great opportunity to swim in some of the fastest pools in the country, and to see some amazingly fast and inspirational swimming as well. There are often a handful of ex-Olympians who compete at this meet, 95-yr-old men and women competing (with some breaking records), and everything in between. Click here for more information on these championship meets or speak with CRM teammates Bill, Jen, Dan, Sue, Chris or Fred. If you or your teammates competed at Nationals, we want to hear about it! Email us. Sue Jensen with her hard-earned hardware! BOSTON, MA -- The New England LMSC proudly presented several awards to outstanding members during the 2018 NE LMSC SCY Championship Meet. Dan’s team all commented on his record keeping as well as making each of them a handmade birthday card, and they shared how Dan has built a loving, supportive team that feels more like a family of which they are all grateful to be a part. 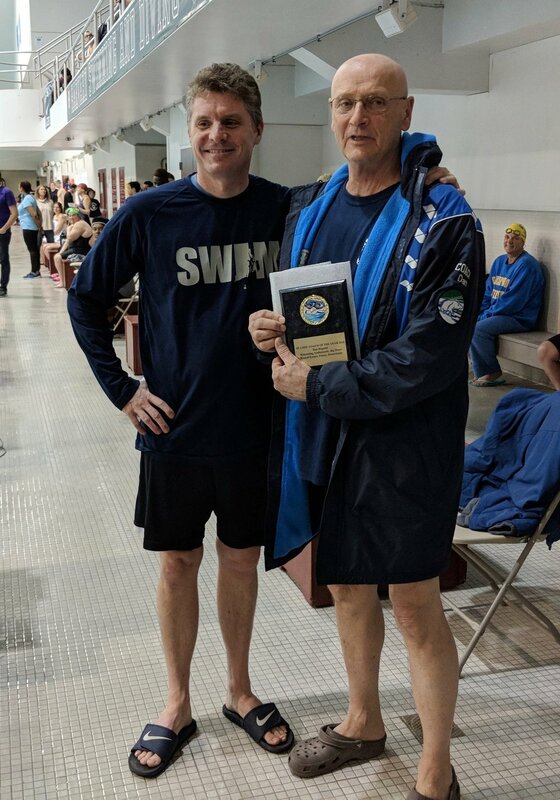 Rick has been the SCY Championship Meet Director for over 15 years and has repeatedly demonstrated outstanding service to Masters Swimming on many levels and consistently promotes Masters Swimming at the Club, NE LMSC, and National levels. Nominators and supporters repeatedly discussed Rick as demonstrating excellence with respect to his role as the NE LMSC SCY Championship Meet Director in addition to the following: best meet director, supportive, encouraging, thoughtful, quality, dedicated, caring, supportive, running the best meet, great music, great announcer, above and beyond, kind, friendly, fun! David’s supporters all recognized the tireless efforts he engages in to promote all kinds of swimming events, from pool to open water. He was thanked for a variety of reasons, including for being a personal kayaker in the Kingdom swim, and received accolades for his outreach in all avenues of swimming. A true supporter of the sport! Joel’s nominators mentioned repeatedly that Joel not only encourages everyone on the team, she calls them if they miss a practice to see if they are okay. She is nurturing and strong, and that has proven to be quite an amazing combination. Priscilla Davis's team of 13 active officials does a masterful job of tirelessly running our Masters swim meets throughout the year. Each championship meet (WPI and Harvard), they spend 20-25 hours on their feet officiating. They also officiate at all our mini meets throughout the year. Not only that, they are professional, good humored and obviously love what they do. New England is blessed to have such an experienced and friendly group of officials running our meets. Frank Wuest invited us to live our best lives. He invited us to embrace the sport of swimming as a vehicle to get involved, to participate, to shine, and to be a part of an incredibly special community as well as to stay fit and active in the pursuit of the negative split! Frank’s passion for the sport was contagious. He was a fast swimmer and he was a committed cheerleader for us all as a collective as well as for all of us individually. With a glint in his eye, and a pace clock in his head, he encouraged us all to go for it! Frank truly represented all that the word community stands for and he did it with grace, ease, humor, love, camaraderie, and at times a little cajoling. Thank you, Frank for continuing to remind us what the most important thing is and always will be: Each other. QUINCY, MA -- Five coaches trekked to the Quincy YMCA to observe an Adaptive Sports New England Para swim workout on Sunday, March 25th. Para athletes have a disability (mobility, visual, or cognitive impairment) that can create additional intricacies for coaches crafting an effective swim workout Laura Dennison, NE LMSC's Para Athlete Chair and member of Charles River Masters, spearheaded this observation initiative. 1) Communication is key to building a strong athlete-coach understanding of possibilities and effective adaptations for inclusion. 2) Patience is important to learning how differently-abled bodies can move through the water effectively. 3) Creating the space for a para athlete to be included in your workouts is essential. 4) Focus on time, not distance, to help keep multi-ability lanes in sync. 5) Focus on what will create forward propulsion for the para swimmer, and release the goal of an "ideal" stroke technique. For additional para swimming resources, see the USA Paralympics website. MAINE -- Despite weather scares, both the Mount Desert Island and Toughen Up Challenge meets ran as scheduled. On January 28, MDI welcomed over twenty swimmers full of smiles and fun times. There just isn't a more pleasant crew of volunteers at a meet anywhere. This environment coupled with the scenic drive makes it a must-swim event. On February 11, the Toughen Up Challenge brought several hard-nosed competitors from New Hampshire and Maine together to compete for the titles of Sprint and Distance Champions. We saw some repeat winners with Jess Beers (MESC) and Anne Uecker (MESC) resuming their reigns as the Queen of Sprint and Distance, respectively. On the men's side, newcomers Orion Huey (MESC) and Valdis Jurka (NEM) were crowned the sprint and distance winners. EXETER, NH -- On February 4, 89 swimmers from 8 clubs braved the trip to Exeter, NH to race in the speedy Roger Nekton Championship pool at Phillips Exeter Academy. With an event line-up featuring everything from 25s to the 1650 there were good options for everyone to burn some calories before Superbowl festivities. A special kudos to those 8 hearty swimmers who stuck around to swim the longest pool event in existence (i.e. the 1650) at the end of the meet. Even more kudos to those who stuck around to count and cheer them on! Super impressive swims included Stacy Sweetser's (GSP) 1:14 in the 100-yard breaststroke as well as the grudge match 50 freestyle where Nic Ohman (GSP) barely bested Tom Phillips (BUMS) by .1 second. Not to be outdone, the top two 55-59 women in the 50 freestyle, Karin Stokes (GSP) and Sue Jensen (CRM), raced to a .02 difference between first and second places. Another impressive swim was the 59.48 in the 100 freestyle by Amy Leveroni of NEM that took all of those younger gals (and even some of the younger men!) to task. The cross-age group competition was also fierce with Ed Gendreau (GBM) showing the less seasoned swimmers, Stephen Carroll (GSP) and Ben Wolfson (GBM) how to go a 1:10.0 in the 100 breaststroke. (It was close, Stephen, maybe next year!) The indomitable Guy Davis (GBM) also took many of the less seasoned age groups to task with a speedy 2:05 in the 200 freestyle; however, youth was able to prevail with an even speedier 2:03 by unattached swimmer Chris Borgatti (someone get him on a club already!). The women’s 100 backstroke was no joke with Beth Estel (GSP) crushing a 1:15 to reign over the 60-64 age group (men included). The shortest races of the day brought on some of the biggest challenges (just ask Mindy Williams (GSP) how hard it is to get going for only a 25!) and some of the fastest swimming we’ve seen! The Newburyport Breakers were good sports in haranguing swimmers from all over to create relays to go up against host team Great Bay Masters. It was a great way to get some practice in before the SCY Championship next month at Harvard where relays can contribute to massive team points! 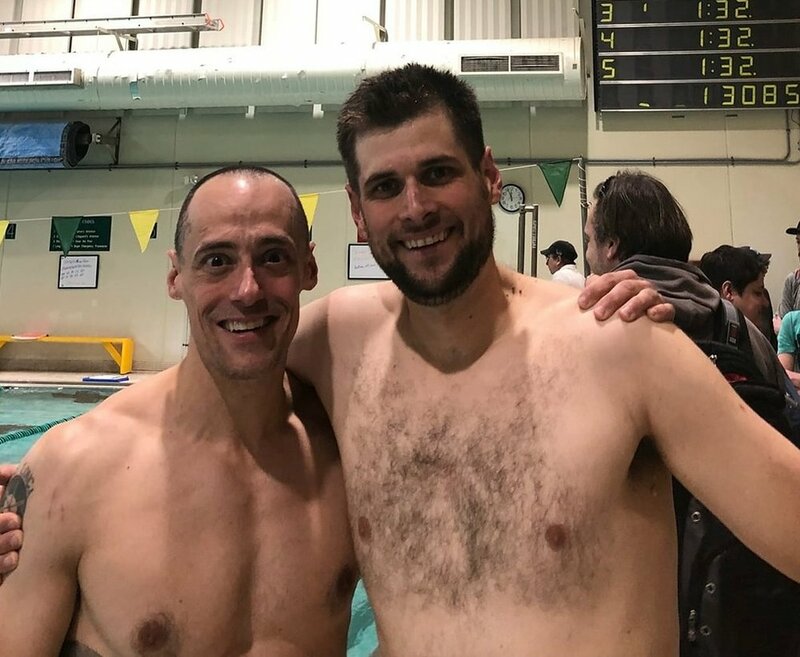 While there were no National records set (next year, guys, next year), we did have at least two swimmers experiencing their FIRST masters meet ever and that made it all worthwhile! 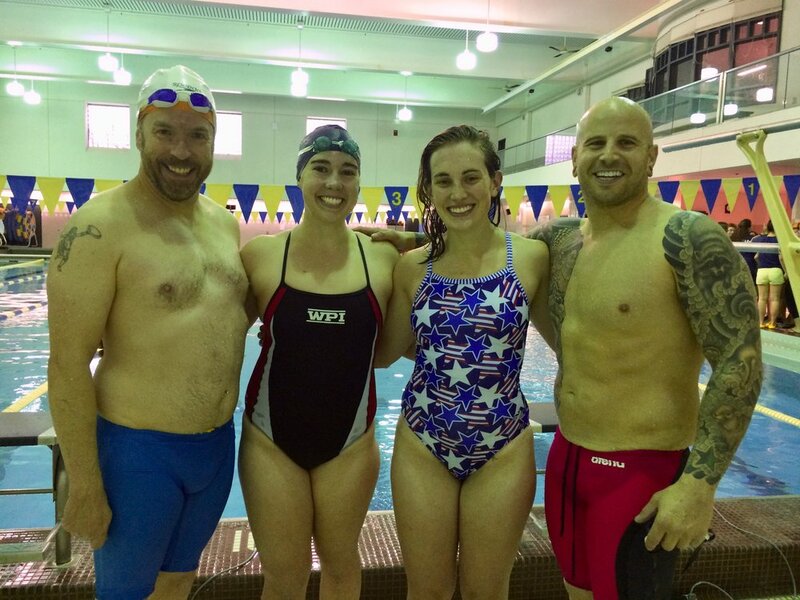 Great Bay Masters greatly appreciates the support of the local swimming community for a fun meet and relay racing! Full results can be found on SwimPhone, and will be submitted to the USMS database shortly. Are You Willing to Go The Distance? NEW ENGLAND -- Congratulations to our New England LMSC, which logged 27,831.80 miles in USMS's 'Go the Distance' (GTD) program last year. One hundred fifteen New England swimmers participated in 2017. The GTD program is an enormously popular free event offered by USMS each year. Any USMS member can set a mileage goal for the year and use their online Fitness Log (FLOG) to track their swimming progress, as well as other training, on a regular basis. GTD swag is available for purchase when you reach various milestones. Brian McLaughlin 1,439.39, Charlotte Brynn 1,312.85. Paula Yankauskas 789.81, Sue-Ellen Booher 728.65, Nancy Tunstall 705.12. Bob Burrow 661.09, Margaret Haskins658.75, Cheryl Daly 644.29, Jane Cheney627.57, Maura Twomey 621.70. Patricia Saint Aubin 595.05, Michelle Toner 500.20. John Shumadine 488.66, Mark Rubacky 488.38, Jen Downing 481.13, Cynthia Needham 486.94, Becky Hunnewell 484.18, Kevin Sullivan 437.24, Sue Jensen 434.02, Susan Knight 415.01, Steven Pohnert 411.81. Dorothy Mullaney 375.48, Alana Aubin 369.60, Benjamin Morse 369.17, Amy Rolnick367.96, Kate Beard-Tisdale 365.82, Daniel Moran 365.31, Laura Delorey 357.89, Thomas Burt 353.90, Christopher Landry 346.75, Rob Schiller 325.16, Mark Alexander 325.12, Sarah Dombrowski 320.74, Beth Eggimann 320.40, David Welch 317.00, Elizabeth Mancuso 306.51, Catherine Laramie 304.74 and Hilary Sullivan 300.02. WORCESTER, MA -- Four hundred sixty-two swimmers from 70 teams flocked to the WPI Sports & Recreation Center for another fantastic NE LMSC and Colonies Zone SCM Championship Meet from December 8-10, 2017. Great Bay Masters' Guy Davis concluded a stellar year of swimming by racking up 215 points to take the men's High Point award by a wide margin. The Granite State Penguins (GSP) were well-represented on the high point list, taking four of the next five spots. Brendan Wright led the way for his team by finishing second overall with 194 points, followed by George Coupe in third (187). Stephen Carroll (174) and Mark Rubacky (172) battled it out in the 45-49 age group and ended up in fifth and sixth place, respectively. Ken Kwa from Charles River Masters (CRM) snuck into fourth place with 174 points. The GSP ladies couldn't let the men have all the fun; with 203 points, Mindy Williams captured the women's High Point award just ahead of teammate Kysa Crusco, who scored 198 points. Sue Garland (191) and Ginger Howell (183) of CRM were third and fourth, and Charlotte Brynn (170) of Stowe Masters rounded out the top five. In the team competition, Connecticut Masters won the Large Team division and Zone Championship by accruing 3,114 points. Unsurprisingly, GSP won the Medium Team division with 2,766 points. UMAC Terrapin Masters (815) took the Small Team title home to Virginia, and Stowe Masters (322) were the Squad champions. Kudos to Worcester Area Masters for doing such a great job hosting the meet, and thank you to all who competed, coached, or volunteered, especially our officials. See you in March! 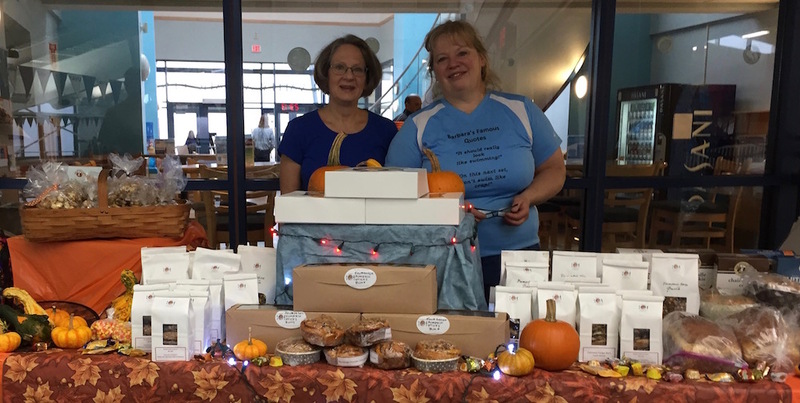 Thanks to UVRay teammates Sue Gray (left) and Susan Reid (right), no one goes home hungry from Leaf Peepers. WHITE RIVER JUNCTION, VT -- The UVRays hosted their 9th Annual Leaf Peepers meet, famous for its friendly atmosphere, fast pool, and phenomenal awards table, on October 28. This year’s version of the short-course-meters meet attracted 75 swimmers from 9 states. Diann Uustal finished the day with one world record and two national records! Rhode Island’s Diann Uustal had a stellar meet. In her first swim of the day, Uustal set a new national record for women age 65-69 in the 200 IM with a time of 3:13.05. In the women’s 200 backstroke, Uustal clocked a 3:04.82, breaking the existing world record by four tenths of a second and shattering the national record by nearly eight seconds. Granite State Penguins (l-r) Tyler Edsall, Kysa Crusco, Beth Estel, and Scott Machinist. Eight New England regional records were set at the meet. Dan Rogacki (Pittsfield YMCA) set three records in the men’s 70-74 age group. His 30.54 in the 50 freestyle broke Al Craig’s record from 1998. His 100 backstroke (1:20.23) and 100 freestyle (1:08.18) were also regional records. 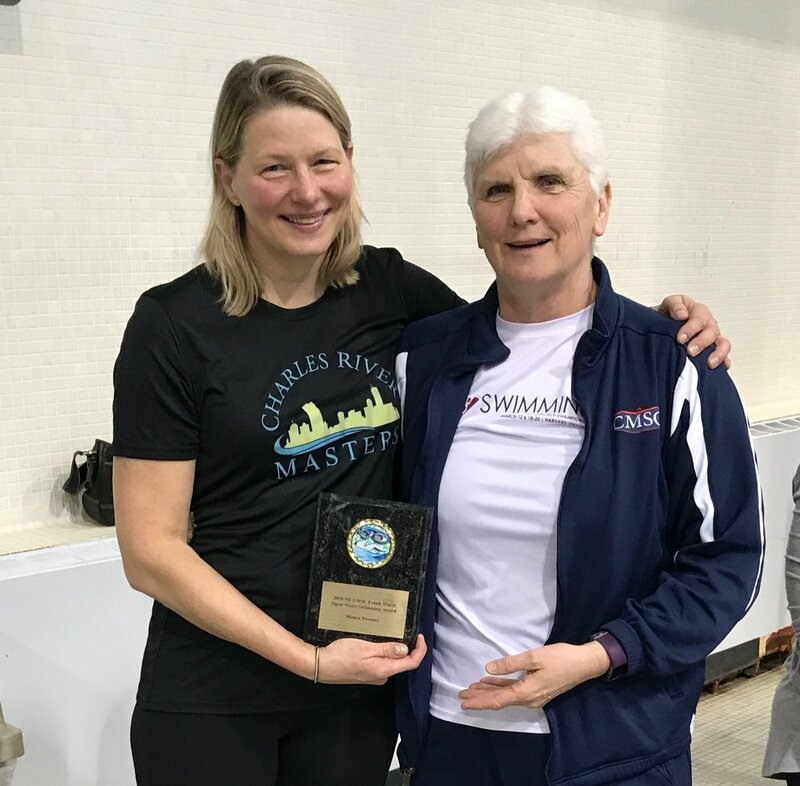 Karen Beirwert (NEM) set two records in the women’s 65-69 age group: 200 breaststroke (3:25.63) and 100 butterfly (1:36.16). Arnold Meardon (UVRays) set two records in the men’s 85-89 age group. His 44.05 in the 50 freestyle and 1:49.10 in the 100 freestyle broke records set by Alexander Luther in 2000. On the record board for men 80-84 was William Jones (Maine Masters), with a 54.88 in the 50 breaststroke. UVRay Sean Uiterwyk (far right) claims Fastest Man in the Pool honors with his 12.46 in the 25-meter freestyle. Volunteer timers are a huge part of every masters mini meet. Dozens of meet records were broken, including four by the UVRay host team. Sean Uiterwyk (men’s 40-44) blitzed the 25 freestyle “splash ‘n’ dash” in a meet record 12.46 to earn bragging rights as the fastest swimmer in the meet. Rob Starkey (men 40-44) posted a 1:10.15 meet record in the 100 butterfly. Jeff Kuvin (men 50-54) set a new meet record of 2:13.16 in the 200 freestyle. UVRay coach Barbara Hummel (women 65-69) posted a meet record 47.41 in the 50 breaststroke. Swimmers review the different legs of the Icebreaker Relay and decide who does what. There were many exciting races, including the 400 freestyle duel between Robbie Allen (Ventura County Masters) and Jeff Kuvin, with both swimmers under the meet record. 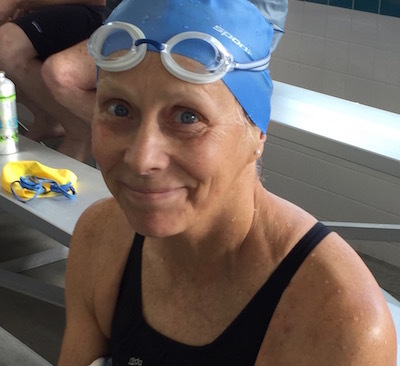 And, as always at Leaf Peepers, there was much joy and emotion for those like Halina Nowak (Mountain View Masters) who were swimming in their first-ever masters meet. Joel Feldman from Keene always has time to smile. Once again, the popular Ice Breaker relay turned total strangers into fast friends. This year’s version involved kickboards, pumpkins, apples, and swimming while connected by noodle to another swimmer. Somehow…it came down to a photo finish! Thanks to all who participated in the meet, and the Rays look forward to seeing everyone at the 10th Annual Leaf Peepers in October 2018. Leadoff swimmers get ready for the start of the Icebreaker Relay. BOSTON, MA -- Fifty hearty swimmers came out on a cloudy, rainy Saturday morning to compete in the 10th Annual Simmons College ‘October Swim Fest,’ held at Simmons’ 8-lane William J. Holmes Sports Center pool on Saturday, October 14th. 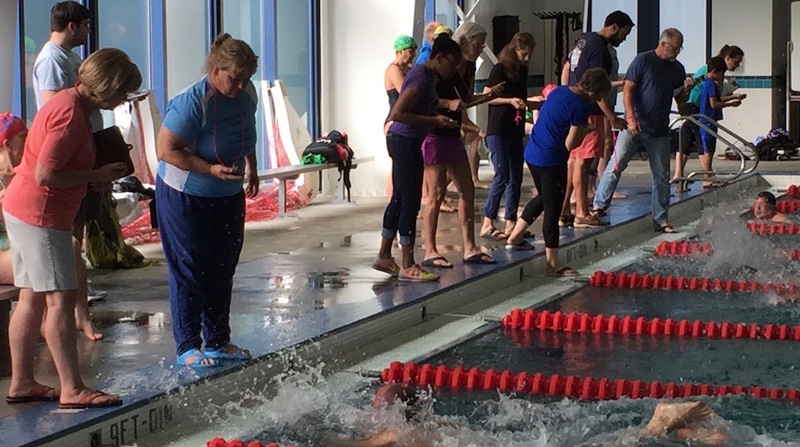 This mini meet is always the first of the fall season, where Masters swimmers come to test out their fitness and readiness levels for the upcoming racing season. Highlights of the meet included the ever-wonderful pool-side hot tub, a solo 100 butterfly for Guy Davis (GBM), and four back-to-back 50-meter swims by Kysa Crusco (GSP). This meet is an annual fundraiser for the Simmons College women’s swim team, who graced the deck as timers, counters, and a very enthusiastic cheering squad. 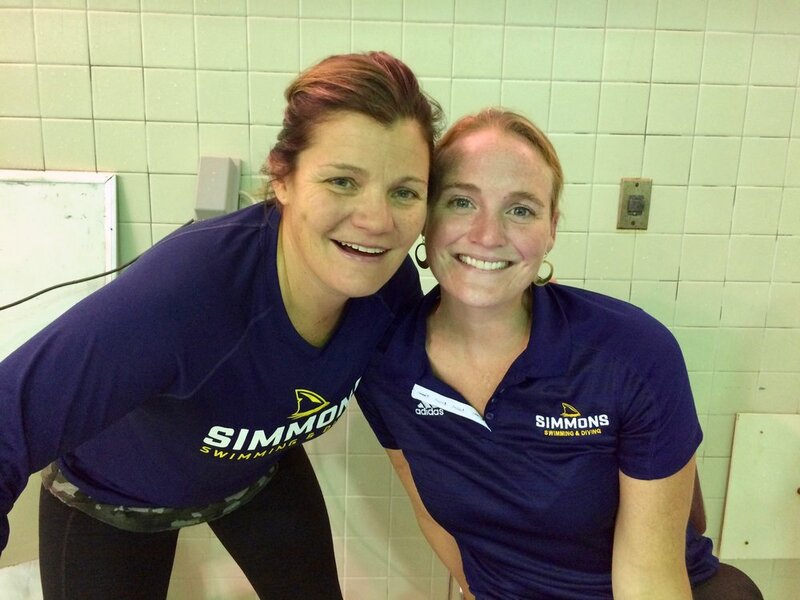 Meet manager extraordinaire and long-time Simmons coach, Mindy Williams, ran the meet seamlessly with assistant coach, Christina Baudis. Mark your calendars for 2018 — Saturday, October 13th. BUDAPEST, HUNGARY -- Twenty-one New England swimmers journeyed to Budapest to swim at the FINA World Masters Championships in August 2017. The Masters World Championships featured over 9,000 athletes across multiple sports, including 6,500 swimmers. The Budapest facilities were amazing. The brand new Danube Arena is on the Danube River with 2 long course competition pools and indoor and outdoor short course warmup pools. A second venue, the Alfred Hajos Sports Complex, was about 15 minutes away on Margaret Island. The Hajos facility has two competition pools and a short course warmup pool. Age groups were assigned to different pools each day to allow competitors the opportunity to swim in the different pools and venues. The meet timelines were reasonable and competition finished each day early in the afternoon (as opposed to other Worlds where races went late into the night). 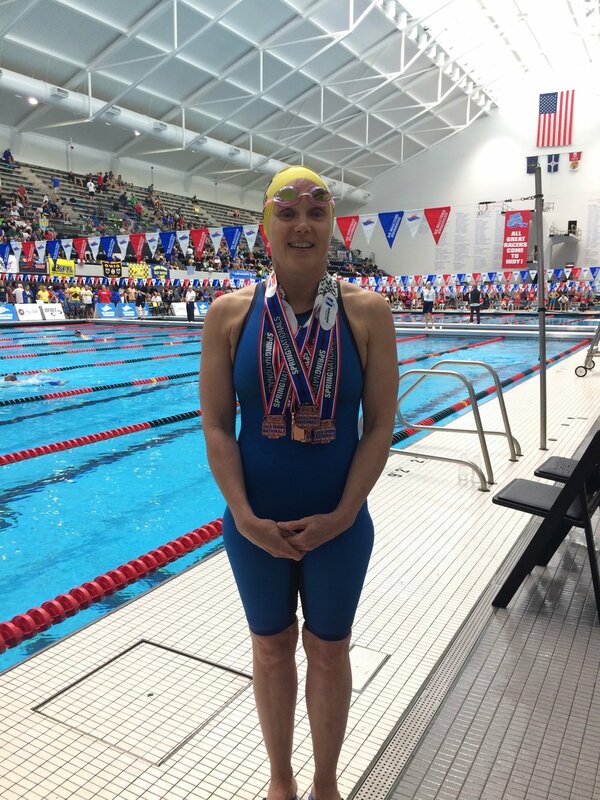 Beth Estel (GSP) stood atop the podium twice in the 60-64 age group, winning the 100m breaststroke in 1:28.18 and the 400m freestyle with a time of 5:30.95. She also took second place in the 50m breaststroke, 200m breaststroke and 400m IM. Ildiko Szekely (BUMS) took the gold in the women's 35-39 200m butterfly with a time of 2:23.45, winning by over 7 seconds. Szekely also earned two second place finishes in the 100m butterfly and 200m IM. Rainy Goodale (MVM), Karen Mareb (GSP) and Mindy Williams (GSP) also earned medals. 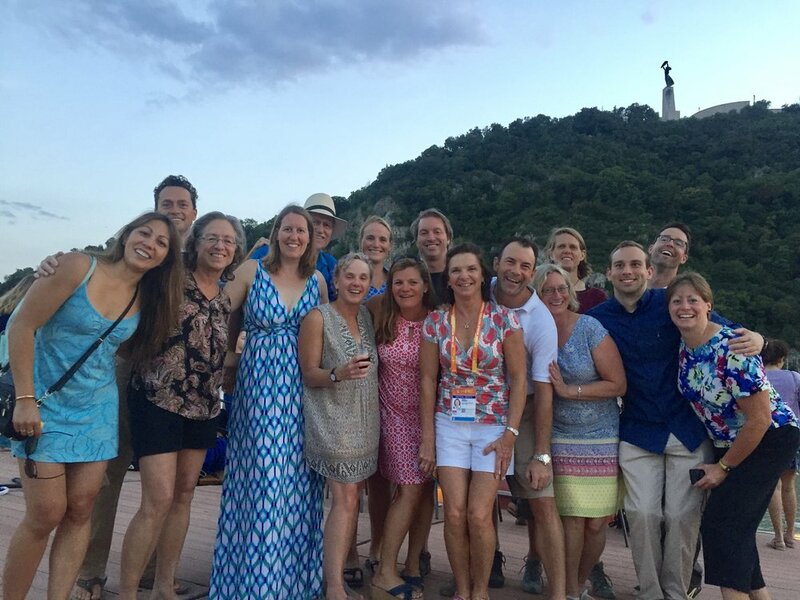 Outside of the pool, New Englanders took advantage of the beautiful sights and attractions of Budapest. The city is famous for its thermal baths and I visited three of them: the Szechenyi Baths, the Gellerts Spa, and the Kiraly Baths. Soaking in the beer baths at the Szechenyi and frolicking in the wave pool (built in 1934!) at the Gellert Spa with teammates Nic Ohman (GSP) and Mindy Williams were favorites. Karen Mareb, Beth Estel and Karin Stokes all loved the 5-hour Budapest food tour. The final day of the competition was a national holiday in Hungary, which was celebrated with a huge fireworks display set off from multiple bridges on the Danube. For me, this Worlds competition was the culmination of 5 years of Masters Swimming. I joined Masters Swimming in 2012 with the goal of finally following through on a fitness regimen. A few months in, there was talk at the pool about the Leaf Peepers Meet at UVAC. I went and I was hooked. Since then, I have attended USMS Nationals, Canadian Nationals, and Worlds in Montreal. The experience of training for and traveling to Budapest with my teammates surpassed all the other meets. Walking out onto the deck from the ready room, to swim in the same pool the elite and pro swimmers had competed in just a few weeks earlier, was intense. The work I put in paid off in my swims with top 10 finishes and personal best times. I enjoyed meeting swimmers from other countries and trading caps. Five years ago, I could not have imagined that swimming would take me to Budapest for the experience of a lifetime with the most amazing, supportive, and inspiring teammates and family. Check out my GoPro video recap at https://vimeo.com/232586357/69f80bc906.